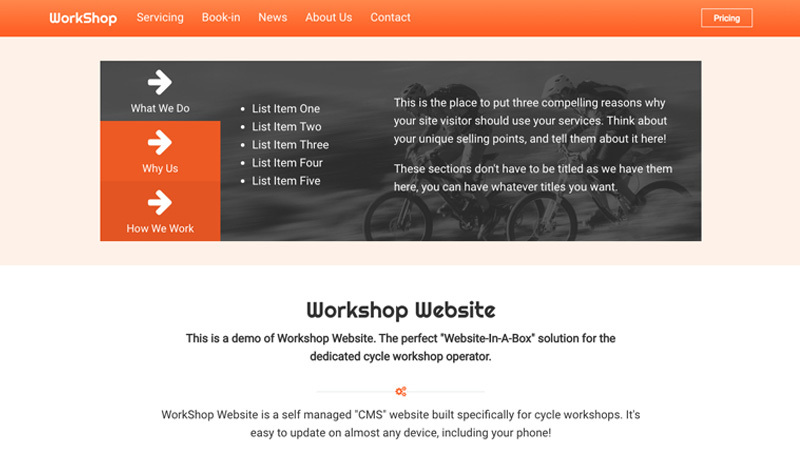 Workshop Website is an extensive content management system (CMS) built exclusively for the stand-alone and mobile cycle workshop operator. It was developed over several years of real-world testing from working workshop businesses. Out of the box you get everything you need to get up and running; building website traffic with great SEO results and converting this traffic to customers using the online booking form. Workshop Website is 100% scaleable: Users can add as many new pages as they wish with whatever content they want, and these pages will automatically appear in the main navigation system. There are various themes available for Workshop Website, each customisable by us before deployment to perfectly suit your needs. For full details and pricing, please visit the "about Workshop Website" page on the demo site.